There are many VET providers across Europe implementing blended learning. This toolkit will focus on six main models on how a college of Further Education can implement a blended approach. It is important to note that not every college fits neatly into a single model, all blended-learning implementations are generally a combination of one or more of these models. 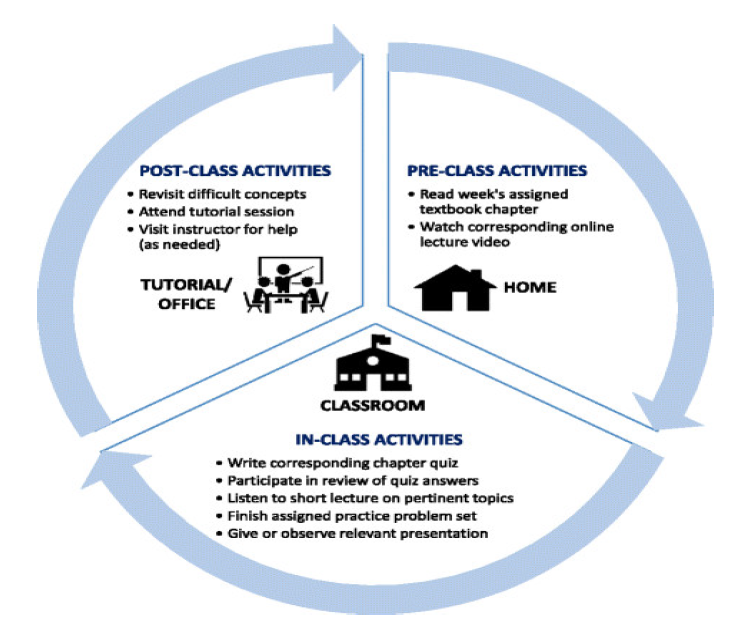 The flipped classroom model is where the lecture and homework elements are reversed. Learners first gain exposure to new material online and off site on their own time, via watching, reading or listening to a pre-recorded video/lecture/podcast over the web. This allows learners to engage with interactive content and focus on key concepts prior to class. In class, on site, allows students more face-to-face time for collaborative activities that clarify the information provided and encourage problem-solving, discussion or debate. Flipped learning seeks to engage learners by means of responsive learning environments, designed to prepare and motivate them to confidently undertake assessment tasks through interactivity. Flowchart of the Flipped Classroom structure and settings. 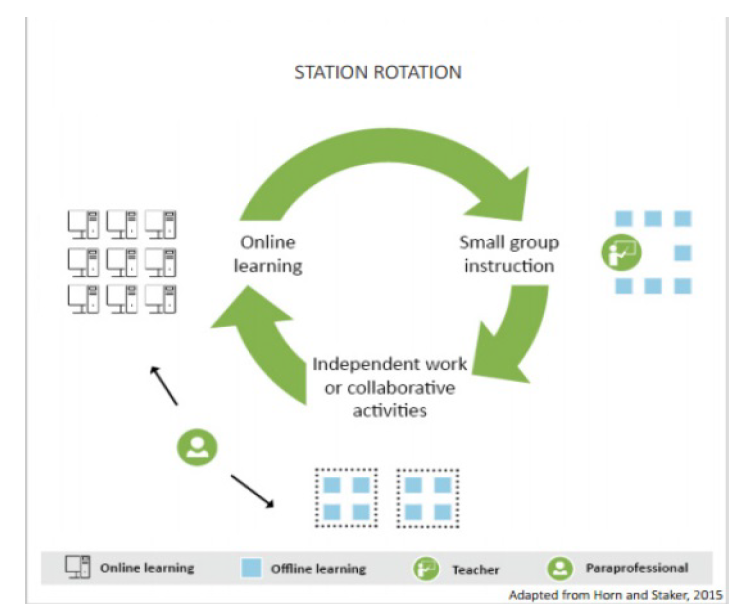 The station rotation model includes any course or subject in which learners rotate either on a fixed schedule or at the teacher’s discretion within a single class. Learners rotate among online learning, direct instruction from a teacher at their desks and small-group work among themselves. Or they can rotate between online learning and whole-class discussion/lecture. Online learning will take place on site in the college on classroom computers with learners completing a variety of activities, including, but not limited to, reading articles, watching videos/listening to podcasts, completing worksheets or carrying out assessments. Through these kinds of online activities, learners have opportunities to work independently and privately. For the offline part of their learning, learners receive direct instruction from a teacher followed up by a variety of activities, which could include independent reading or other pencil-and-paper tasks. Small-group work can also be used to complete skill tests, work on projects or discuss/debate important coursework topics. One strength of this Station-Rotation blended learning model is that teachers increase their opportunities to work with small groups of learners. This component can benefit teachers who work with large group sizes. Small group work with learners makes it possible to address the different needs of individual learners and to engage them in the subject based on their knowledge and depth of understanding. The Enriched Virtual model is an alternative to a full-time online course. This model allows learners to complete the majority of coursework online, at their own pace, in their own time outside of the college, but they must attend college for required face-to-face learning sessions with a teacher. Daily attendance is not required so colleges can allow learners to attend once, twice or three times weekly. The flex model uses online learning to deliver the main content of the course with learners still learning primarily on-site. Every class is divided into online and offline components. The teacher provides face-to-face support on a flexible basis through activities such as small-group instruction, group projects, and individual tutoring. For example, some flex models may have face-to-face teachers who supplement the online learning with face to face contact on a daily or weekly basis. The college can require learners who aren’t making progress on their own to attend small group sessions, while allowing learners who are moving at a faster pace to attend them if they choose. Apart from small-group instruction, teachers are available to provide one-on-one help to learners when needed. The a la carte model offers a learner the opportunity to take one or more courses online in addition to traditional courses at a brick-and-mortar college. Unlike full-time online learning, in the à la carte model, learners at a particular college may choose between online and offline courses at their convenience. The teacher for the A La Carte course is the online teacher. 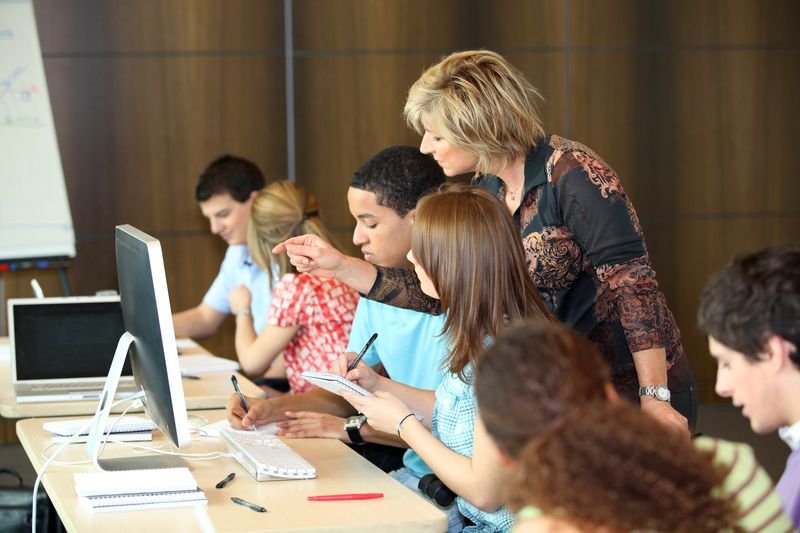 Learners who take courses A La Carte can at the same time continue to have face-to-face educational experiences at a brick-and-mortar college. Lab rotation model is very similar to station rotation, except that with lab rotation, learners fulfil the online learning part of instruction in a computer lab rather than in the classroom. 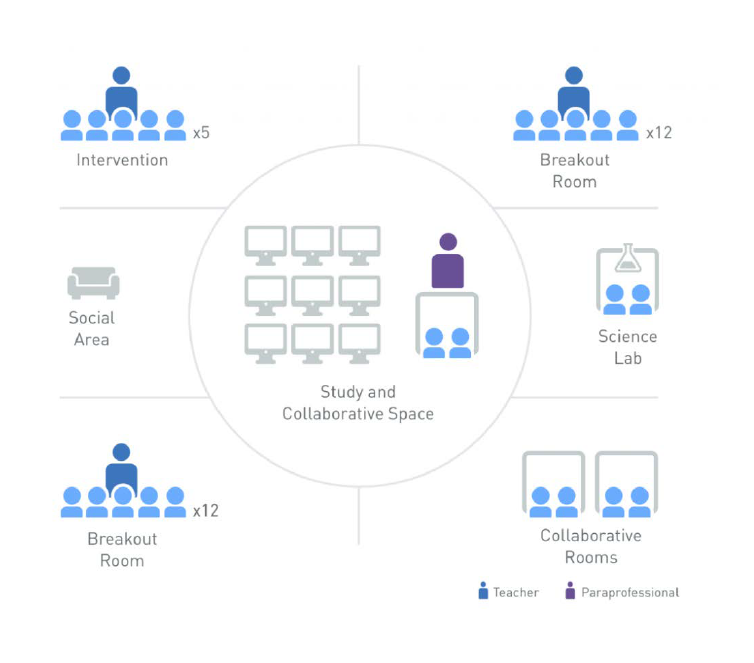 One benefit of this model is that using the lab frees up classroom space for other activities within the rotation model.